For almost 20 years, the Countess of Abbingdon—better known as Lara Croft—has been in hot pursuit of cultural relics around the world, and hasn’t let anything get in her way. Even if you’ve been behind her since 1996’s Tomb Raider, there are a few things about the hit game and its unstoppable heroine that you might’ve missed in the hunt for the Scion. 1. BEFORE LARA CROFT, THERE WAS A MILITARY ACE NAMED LAURA CRUZ (AND BEFORE THAT, A MAN). While the game was in development, designer Toby Gard went through a few possible versions of the franchise’s heroine. In the earliest stages, the main character was roughly sketched out as a man. To differentiate the game from the Indiana Jones series, however, Gard and his team decided to make the protagonist a woman, and came up with a militaristic, South-American lethal weapon called Lara (sometimes Laura) Cruz. Eidos Interactive, the parent company behind Derby, UK-based Core Design, reportedly then asked for a more “UK-friendly” name (with the supposed aim of appeasing UK and U.S. audiences), so the Core team thumbed through the Derby phone book and voted on possibilities ‘til they settled on the surname Croft. 2. CROFT MANOR WAS BUILT OVER ONE WEEKEND. Work on Tomb Raider began in 1993, took about 18 months total, and concluded with the game’s 1996 launch for PC/DOS, Playstation, and Sega Saturn. However, designer Toby Gard created Croft Manor, Lara’s stately family home (and the game’s training level), over one busy weekend, using the facade of Core Design’s studios in Derby for inspiration. 3. THE GAME WAS INSPIRED BY INDIANA JONES AND JURASSIC PARK. Similarities between Tomb Raider and the Indiana Jones films likely didn’t escape gamers, and the team at Core Design, who developed the original title, wanted it that way. The game honored Dr. Jones’ swashbuckling archaeology with its poison darts, booby-trapped boulders, and spiked pits (among other Easter eggs like the Ark of the Covenant being stashed at Lara’s mansion), but also paid homage to the bone-seekers of Jurassic Park with strategically placed Tyrannosaurids. Tongue-in-cheek references to Indy can also be found in the later Anniversary and Last Revelation editions of the game in the forms of a lost whip and hat (crushed against the underside of a massive stone ball) and a whip-toting skeleton, respectively. Lara sometimes tackles mythical forces and locales in the game, but she also visits real-life places of historical significance, too. Her time in Peru includes a visit to Vilcabamba, which was considered the Incan Empire’s last stronghold after the late 16th-century Spanish invasion of the region and was re-discovered twice before its excavation began. 5. ... BUT ONE REAL-LIFE RAIDER WASN’T HAPPY ABOUT HIS NOD FROM THE GAME. The French archaeologist Jean-Yves Empereur, who famously discovered the remains of the Pharos lighthouse near Alexandria (one of the seven wonders of the world), “objected to the [the use of a] character of the same name and profession”—a French archaeologist dubbed Jean-Yves—in the series’ fourth installment. He received an apology from the game’s producers in 2001. 6. 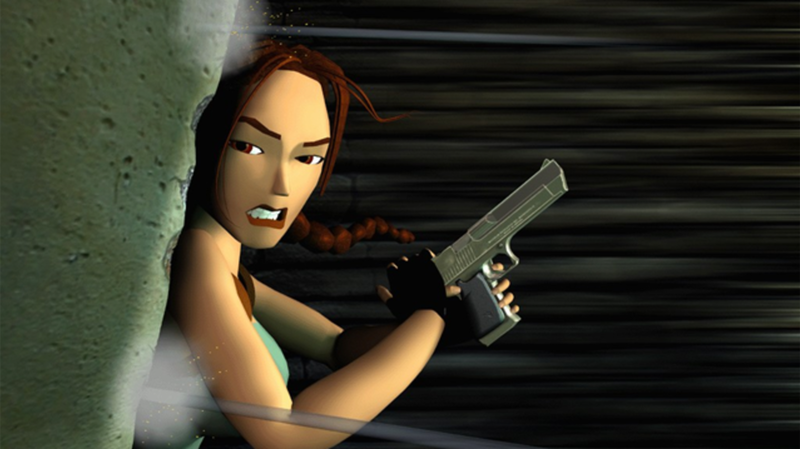 TOMB RAIDER HELPED INNOVATE THE 3D-PLATFORMER GENRE AND PUT WOMEN IN LEADING GAME ROLES. 7. LARA’S REALISTIC LOOK MEANT SHE WAS POSITIVELY ROLLING IN POLYGONS. By the time 2008’s Tomb Raider: Underworld was rolled out, Lara had acquired a full 32,816 rendered polygons, making her the most detailed game character to date. 8. TOMB RAIDER WAS AN INSTANT HIT, AND THE PLAYSTATION’S "KILLER APP." The franchise’s first game topped best-selling game charts within hours of its release and held the title for months to come (despite the release of Super Mario 64 several weeks earlier), and ended up selling close to 7 million units. Because of the attractive navigability of its 3D-rendering, it also gave a major boost to sales of the first Sony PlayStation, which licensed the next two Tomb Raider titles almost immediately and sold over 100 million consoles. 9. IN THE LATE ‘90S, LARA WAS AN INTERNATIONAL COVER GIRL. While the game itself got plenty of praise, Lara Croft herself was Core’s breakout star. In the late ‘90s, Lara appeared on the covers of publications around the word, such as The Financial Times and The Face (the latter with an eight-page spread) in the UK and TIME and Newsweek in the U.S., among others. Lara also showed up in ads and commercials for Visa credit cards, sodas, cars, and other products, was on a French postage stamp, and recorded songs with a member of the British band The Eurythmics (via a model who portrayed her at the time, and sang in character). A special diving suit designed for Lara by aquatic clothier Sola even made it into the second Tomb Raider game. 10. SHE WAS ALSO A ROMANTIC ICON. 11. HER CELEBRITY EVEN LED TO A COLLECTION OF DOLLS FOR ADULTS. In 2001, a line of Lara Croft dolls (modeled on Lara Croft: Tomb Raider star Angelina Jolie) were “[aimed] at young adults” and collectors, the Associated Press reported. Rather than being play-worthy toys for kids, the “curvaceous” dolls were meant to be treasured from a distance. 12. TOMB RAIDER HAS A TON OF (USEFUL) GLITCHES. Thanks to the game’s generous 3D landscapes and the limits of 1996 technology, Tomb Raider contains a multitude of bugs and glitches that an enterprising player can use to their advantage. By utilizing the “Corner Bug,” for example, players can collect an otherwise unreachable Medipak in one level. One fan has compiled a long list and "how to" guide for such favorites as Get Stuck in the Wall, Skip to the Final Room, Jump Through the Wall, Inactive Lions 1 and 2, Glitchy Movable Block, First Room Alternate Route, and Aqueduct Shortcut. 13. LARA CROFT’S FIGURE SPRANG FROM A PROGRAMMING ERROR. While not a proper glitch, Lara Croft’s notorious curves are also the result of an error by programmers in that, during a test-adjustment phase, her bustline was accidentally increased by 150 percent rather than getting the 50 percent boost supposedly intended by a designer (the team elected to keep the goofed version of her body for the game). 14. LARA CROFT’S AN ARCHETYPE FOR BADASS FEMALE CHARACTERS IN GAMING. The 2013 release Tomb Raider, a series reboot that shows Lara as a younger, less experienced version of the Lara we met in 1996’s Tomb Raider, further expands her backstory and personality, but features a physically toned down, more realistic heroine, too—one that developers hoped players would “want to protect” rather than sexualize, Kotaku wrote. Business Insider also commented that the franchise’s latest installation—which, as PC Gamer reported, has sold more than 8.5 million units, breaking overall, launch day, and first-month sales records for the franchise—is “historically” important for further improving upon Lara’s dimensions (or lack thereof) as a no-nonsense action heroine and better portraying women in games, period. 15. TOMB RAIDER AND ITS STAR ACCOUNT FOR SIX GUINNESS WORLD RECORDS.